This 35mm. stainless steel Rolex Oyster Perpetual Date dates to 1961 and has an original dial with one age mark (not detracting) along with re-lumed original arrow steel markers and baton hands. The steel case is without and major flaws and has NOT been over-polished. On the wrist, this watch looks fantastic and the dial displays a slight patina which is rather pleasing. The automatic winding ROLEX movement was recently cleaned and operating accurately. 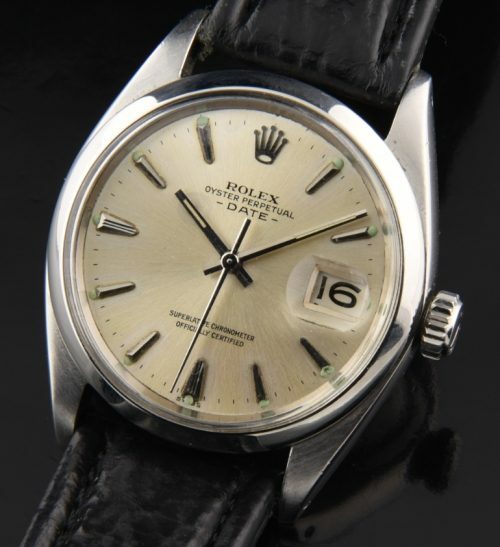 This is a very classic and clean-lined vintage ROLEX watch that will make a perfect gift.